Come to this seminar in Dallas, Texas to learn a martial art created for survival with and against weapons. This system of martial arts can be used with with whatever weapon you have or no weapons at all. this martial has been tested for personal and tribal survival. Use of all weapons is part of the system and specifically one of the many weapons categories covered in this seminar will be the hand axe or tomahawk. It is a commonly available tool that also can be a very hand personal protection weapon. Other weapons will be covered as well including knife, stick, sword, gun and empty hands. The only good defense is a good offense, and this art is separated from other martial arts by this concept. Email jason@bladefighting.com if you are planning to attend the seminar. Don't miss this seminar from a man who has created so many renowned fighters. Leopoldo Tortal Gaje, Jr. is the supreme grandmaster of the pekiti-tirsia kali system by virtue as the sole inheritor from his maternal grandfather, grand tuhon conrado b. tortal. Grand Tuhon Gaje is professionally recognized as the worlds leading authority on edged-impact weaponry and filipino martial art. after graduating from west negros college in bacolod city, negros occidental, philippines and serving in private business, he emigrated in the united states in 1972. Grand Tuhon Gaje pioneered the teaching of kali and authentic filipino martial art on the east coast from his headquarters in new york city and introduced real full contact stickfighting across the united states producing both u.s. and philippine national champions including the grand champion of the first (1st) national arnis (kali) tournament held in the philippines in 1979. as naraphil commissioner for north and south america and europe he promoted the filipino martial arts in these areas respectively and in other far east asian countries. As national training director for the justice system training association and the united states police defensive tactics training association, tuhon gaje developed the safety baton system and edged weapon awareness/strategic knife defense programs and introduced these and other tactical skills nationwide to federal, state and local law enforcement agencies. as testified by dr. kevin parsons, leading law enforcement legal authority in the united states, the techniques of leo gaje have revolutionized the use of force. and these tactical training programs are the most progressive, effective and advanced methods for the application of intermediate force, liability reduction and officer survival available to the law enforcement community today. in 1988, tuhon gaje was technical advisor and appeared in the internationally released calibre press video surviving edged weapons, critically acclaimed as the finest law enforcement training video ever made. Grand Tuhon Gaje has developed military close-quarters combat skills programs and trained special military forces from across the world. additionally, he has trained presidential/head of state protective forces from the philippines, asia, north america, and europe. 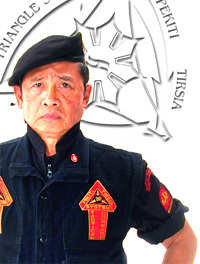 Featured on the covers of the leading martial arts magazines and a member of the martial arts hall of fame and karate hall of fame, Grand Tuhon Gaje has been recognized for exemplary achievement for the worldwide propagation of pekiti-tirsia and the indigenous filipino martial arts by philippine president gloria macapagal-arroyo. tuhon gaje continues to propagate pekiti-tirsia kali and the filipino martial arts worldwide through cultural, educational, full-contact sports competition and tactical training programs to military, law enforcement and security forces. The blademaster, grand tuhon leo t. gaje, presents the most advanced and complete systems of combat from weaponry to empty hands through the legendary art of pekiti-tirsia kali.